Creating Passionate Users: Do your graphics say the wrong thing? Heh, my first reaction was exactly what you wrote, except I don't know my dog breeds. Your improvement still feels a bit off. It's clear that three dogs are a problem, but it's still not clear why. Are they just spread too wide across the trail? Or maybe the stickwoman is allowed to have her own dog, and allowed to let her dog interact with one other dog, but not allowed to let her dog near a crowd of dogs? I'm no graphic designer, but I'd start with the stick woman, and a dog on a leash to the right, then another dog on a leash to the left, then a third dog on a leash to the right. Hmm. Scott, nice idea but the leashes would complicate the design (and the trail is leash optional). Also adding to different sides doesn't read effienctly. When drawn, it looks more like a pattern puzzle, and perhaps is asking what is the correct third line - perhaps it was meant to be dog, person, dog, person. Which is where the problem is... it _is_ a pattern puzzle. Hmm. I guessed it was something about the dog, wasn't sure it was the breed, maybe the last dog had fleas. Man I like this blog. Get's you really thinking. How do you clear away from the gender issue. 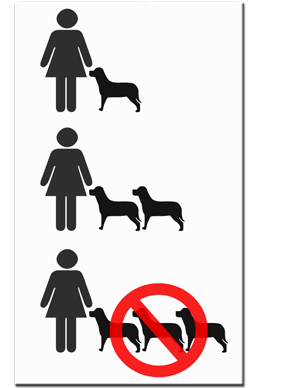 Does your new sign mean men with 3 dogs are ok. Only kidding. If you put: 1 (checkmark), 2 (checkmark) and 3 (big x) next to each line, I think it becomes very clear that 1 or 2 dogs is okay, but 3 dogs is not. Anyway, "No more than 2 dogs per person" is way faster to parse than even the improved sign. I'd rather have 7 words than a thousand. Just as another suggestion: maybe crunch it all down into one graphic - one figure with 3 dogs, the thrid w/ an X through it. Can't it be assumed that if two dogs are OK, so is 1? When I read some of these comments, I think that lots of us have lots of time in our hands!!! Maybe it's just me, but when it comes to information to be conveyed to a general public, I see no problem whatsoever in using good old plain text to carry a complex message that can't be explained in less than four words. 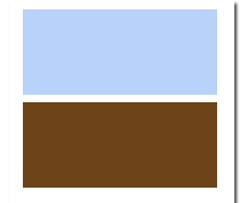 Graphical symbols are good to convey simple ideas but hopeless at more complex concepts. That's why we have "OK" and "Cancel" symbol buttons in a GUI but we do not have one for "re-format disk and re-install Windows". Other than the BSOD - but that's STILL text! "More than 2 dogs per person NOT permitted"
El problema con solamente usar el texto es que no todo al mundo hable inglés. Which is this gringo's attempt at saying that signs are good when you can't count on everyone knowing how to read-- or read a single language. Lloyd, Stephen: I had to laugh out loud at that one! It actually means, "People wearing DRESSES can have a maximum of two dogs." Jake: I thought about that, and was on the fence. I wasn't 100% sure it said it all, but if it does, then your way would be much better. 2) Most of us don't have the problem of using graphics when words will do just fine. In the tech world, we use FAR too many words when graphics would be 1,000 times better for quicker and more accurate grokking, retention, and recall. OK, so back to the exercise: suspend disbelief and imagine that you could not use words to say it. If you don't need practice in thinking and communicating visually, then you can help the vast majority of us who do! Actually it implies that people wearing dresses are not permitted three black dogs (and there's no indication about four as professional dog walkers would no doubt seek to exploit). Thus, in this case, it would be better to use actual photos of various combinations of gender specific walkers and varieities of dogs. Those combinations which are unlawful would be photographed receiving a ticket from a warden. What a wonderful country! Yes, there would be grey areas for debate, but on the grounds that ignorance is no defence, all people too stupid to understand this simple premise would deservedly be fined. I guess you don't even need the first line of your graphic (the one with just one dog). It's safe to assume that if two dogs are allowed, than there's no reason why one dog would NOT be allowed. Although, this requires some thought on the part of the reader, and sometimes thinking is too much to ask. What you can leave out from a graphic is determined by what you can assume the viewers implicitly understand. Without a common implicit understanding, any communication is ambiguous, even if you do use text. As a non dog-owner, I brought in an assumption that "under control" was a synonym for "on a leash", so even the written language above initially confused me. Can we assume that dog owners are used to rules about numbers of dogs on and off leash, and expect to see those kinds of instructions in signs? Otherwise who knows what it could mean, given a different implicit understanding: a future archaeologist might come up with the theory that the sign belonged to a temple in a dog worshipping society and that acolytes had to be accompanied by one or two dogs to proceed along the path. Oh that is too too good, DL. I may never see the world the same way again now that you said that... what a fun way to look at signs. Of course you did make a key point that implicit understanding and previous context matter. And in fact, I actually do NOT understand all the dog rules at the trail (and once DID get a $50 fine for not having a leash ON me, even though my dog was under control... you still have to carry a leash even if you're not required to use it). But for example, I'm not sure what happens when you have a combination of on and off-leash dogs, although it appears that you could have 247 on-leash dogs as long as not more than two dogs "under your control" were off-leash. Sheesh. But I'm getting one lesson here... that even trying to communicate something seemingly so simple isn't always quite as clear as it appears. strikes law. Three offences and the dog gets it!" This is one of those situations where the law is getting in the way of itself, ironically due to what I assume is an attempt to be as lenient as possible. The intent of the law is that you be able to control any canine(s) you may bring to the trail. So the law SHOULD just be "no out of control canines," not "we assume you can control two dogs but not three dogs so you can have two or fewer but you have to carry leashes for them just in case you can't actually control them after all, and if you want other dogs on leashes that's cool too." "Each human can have no more than two dogs under their control." Drop the human from the graphic and show the dogs with collars attached. In the background place an image of a hiker carrying a leash to further imply control. 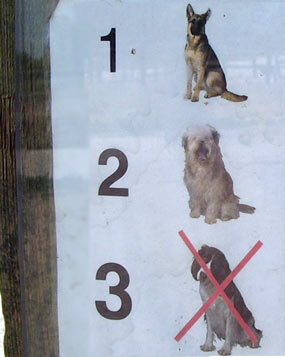 The X on the third image is over both the dogs and the hiker. DL, you can't assume anything about dog owners knowing and understanding the rules. In all the examples given, only Chris even tried to address the second point of the sign. That is, that the up to two dogs off-leash must be under control. In my book that means can you keep your off-leash dog from running up to my on-leash dog? Can you get it to come by calling it once? Will your dog leave the hiker who really doens't like dogs alone? The "future archaeologist" perspective is a good exercise. 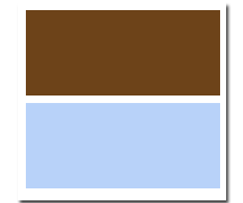 It kind of makes my little Photoshop/Web design issues seem trivial. "Hello. Excuse me. Can you tell me where I am? In our country, we send pictures of people speaking our sign language in Outer Space. We are speaking our sign language in these pictures. Do you think that They will think his arm is permanently attached in this position? Oh, do you think They will read our signs? In our country, Goodbye looks just like Hello. Say Hello." Sorry if someone had already mentioned this (didn't get a chance to read all the comments), but I'd say that the most effective way to pictorially represent the 'no more than two dogs per person' rule is to depict three people (stick figures), at the same level, from left to right. The leftmost person keeping one (abstract) dog in close proximity, the middle person keeping two dogs in close proximity, and finally the rightmost person keeping three dogs in close proximity. The third person and the three dogs are then crossed with a red X, or with a stop sign. I know this is a minor quibble, but I think it makes a hell of a difference, because it implies walking with dogs. The original solution, with three people and their respective dogs lined up vertically, lose some of the trail context. What about two people with four dogs - ok? Here in open country on farmland or commonland loose dogs are liable to be shot by farmers concerned about sheep/lambs. And no dog is under control if off the lead/leash! The best sign locally to deter bad behaviour with dogs, is the one showing the number of dogs shot year-to-date. It has several crossings out with numbers replaced with greater totals as the year progresses. Visitors who like to let their dogs off the lead tend to have second thoughts after seeing that!